Contact us to develop an affordable and comprehensive customized group college tour for YOUR student population that best fits YOUR budget. goCAMPUSing works closely with its clients to develop a customized college tour experience that best fits the needs of their student population. All of goCAMPUSing’s team members, are there throughout a college tour, and are extremely well versed in the entire college selection, application & admissions processes. goCAMPUSing tour staff manage every aspect of the college tour, and are there also as a resource for student to ask questions on the colleges seen on a tour as well as offering information regarding similar colleges not seen on a tour. goCAMPUSing’s mission is to help students find their “right fit” colleges – Academically, Socially and Financially. Aside from learning about colleges & exploring campuses, sightseeing, and participating in fun activities, safety & comfort are always a priority. Who does goCAMPUSing developed customized college tours with? What does a goCAMPUSing Custom College Tour encompass? 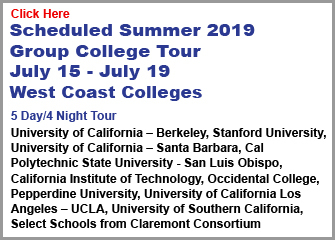 ○ At Least One goCAMPUSing College Advisor is on Every Tour – to Manage All Aspects of a College Tour Including: Ground Transportation, College Visit & Schedules, Meals, Extracurricular Events/Activities, Overnight Lodging, and Security. ○ goCAMPUSing College Advisors are also there to Answer Student’s Questions About the Colleges Visited, College Life, and the College Preparation, Selection, Application, and Acceptance Processes. ○ Since Our Inception, goCAMPUSing has taken Thousands of Students to Tour Over 200 Different College/University Campuses throughout the United States. ○ Because Every goCAMPUSing College Advisor Toured so Many Colleges, they offer Unique Insights Regarding Information About Other Colleges NOT Visited, Providing Students with More Options than Just those Colleges Toured. Professionally Trained & Licensed/Certified Security Guards Stay in the Hallways of the Hotel from 11pm -5am to Insure Students Stay Safely in their Assigned Rooms Without Being Disturbed by Any Outside Guests While Allowing Chaperones to Rest Up for the Exciting Day Ahead! 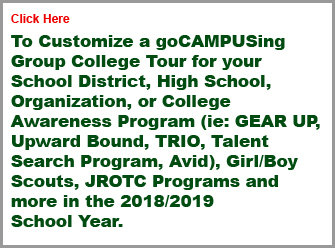 If you are interested in organizing a college tour for your high school students, whether your group be 15 or 150, feel free to give us a call at (516) 941-6992 (Monday – Friday 10am – 4PM Eastern Time), OR email us at info@gocampusing.com or simply fill out the form below. 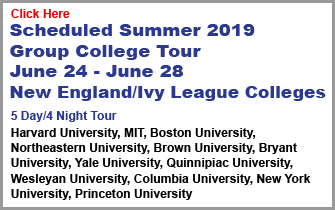 We will be happy to help put together college tour experience designed specifically for your students’ interests, grades, budgetary needs, and geographic region. Adelphi University, Austin College, Amherst College, Bard College, Bates College, Blinn College, Boston College, Boston University, Brandeis University, Brooklyn College, Brown University(IVY), Bucknell University, California State Polytechnic University – Pomona, California State University – Dominguez Hills, California State University – East Bay, California State University – Fresno, California State University – Long Beach, California State University – San Marcos, Carnegie Mellon University, Case Western Reserve University, Catholic University, Cheyney University, Colby College, College of New Rochelle, Columbia University(IVY), Connecticut College, Cornell University, Dallas Baptist University, Delaware State University, Denison University, Dominican College, Dutchess Community College, Earlham College, Emmerson College, Franklin and Marshall College, George Washington University, Georgetown University, Hamilton College, Hartwick College, Harvard University(IVY), Haverford College, Hobart & William Smith Colleges, Howard University, Iona College, Ithaca College, Kenyon College, Lafayette College, Lamar University, Le Moyne College, Lehigh University, Lewis & Clark College, Lincoln University, Louisiana State University, Louisiana State University – Eunice, Lycoming College, Manhattanville College, Marist College, Massachusetts College of Liberal Arts, Mercy College – Dobbs Ferry Campus, Mercy College Manhattan Campus, Molloy College, Nassau Community College, NJIT (New Jersey Institute of Technology), New York University, Northeastern University, Occidental College, Oberlin College, Parsons School of Design, Pepperdine University, Philadelphia University, Pitzer College, Praire View A&M University, Princeton University, Quinnipiac University, Reed College, Rhode Island School of Design, RIT (Rochester Institute of Technology), Rowan University, RPI (Rensselaer Polytechnic Institute), Rutgers University, Sacramento State University, St. Edwards University, St. John Fisher College, St. John’s University, St. Mary’s College of California, St. Mary’s University – San Antonio, San Diego State University, San Francisco State University, Santa Clara University, School of Visual Arts, Seattle University, Seton Hall University, Skidmore College, Sonoma State University, Southeastern Louisiana University, Southern Methodist University, Southwestern University, Stanford University, Stephen F. Austin State University, Stony Brook University, SUNY Albany, SUNY Binghamton, SUNY Brockport, SUNY Broome, SUNY Buffalo, SUNY Canton, SUNY Cobleskill, SUNY Cortland, SUNY Delhi, SUNY Farmingdale, SUNY New Paltz, SUNY Potsdam, SUNY Oneonta, SUNY Platsburgh, SUNY Polytechnic Institute of Technology, SUNY Potsdam, SUNY Purchase, SUNY Sullivan, Syracuse University, Tarleton State University, Temple University, Texas A&M – San Antonio,Texas A&M – College Station, Texas A&M – Commerce,Texas A&M – Corpus Cristi, Texas A&M – Kingsville, Texas Christian University, Texas Lutheran University, Texas State University – San Marcos, Texas Woman’s University, Tompkins Cortland Community College, Trinity University, Tufts University, Tulane University, University at Buffalo, University of Bridgeport, University of California – Berkeley, University of California – Davis, University of California – Los Angeles, University of California – San Diego, University of California – Santa Barbara, University of California – Santa Cruz, University of Houston – Victoria, University of Louisiana Lafayette, University of Maryland – College Park, University of Massachusetts – Amherst, University of New Haven, University of New Orleans, University of North Texas, University of North Texas – Dallas, University of Oregon, University of Pittsburgh, University of Portland, University of Puget Sound, University of Redlands, University of Rhode Island, University of Rochester, University of San Diego, University of San Francisco, University of Scranton, University of Southern California, University of Texas at Arlington, University of Texas Austin, University of Texas at Dallas, University of Texas at Dallas,University of Texas at San Antonio, University of Texas at Tyler, University of Washington, Vassar College, Washington and Jefferson College, Wesleyan University, Yale University(IVY) …And More! Adelphi University, Amherst College, Austin College, Belmont University, Boston College, Boston University, Bronx Community College(CUNY), Brooklyn College(CUNY), Broome Community College, Brown University(IVY), Cal Poly Pomona, Cal Poly San Luis Obispo, California State University Fresno, California State University Northridge, California State University San Marcos, Catholic University, Cheyney University, Claremont McKenna College, Colgate University, College of New Rochelle, College of Saint Rose, Columbia University(IVY), Cornell University(IVY), Delaware State University(HBCU), Dillard University(HBCU), Dominican College, Drexel University, Everett Community College, Fairfield University, Fordham University, Franklin and Marshall College, Gallaudet University, George Washington University, Georgetown University, Goucher College, Harris Stowe State University, Hartwick College, Harvard University(IVY), Haverford College, High Point University, Houston Community College – Central, Howard University(HBCU), Hunter College, Ithaca College, Johns Hopkins University, Kean University, Kingsborough Community College (CUNY), La Salle University, Lafayette College, Lamar University, La Salle University, Le Moyne College, Lehigh University, LeTourneau University, Lewis & Clarke College, Linfield College, Lindenwood University in St. Charles MO., Lipscomb University, Louisiana State University, Loyola Marymount University, Manhattanville College, MIT (Massachusetts Institute of Technology), Morgan State University(HBCU), Mount Holyoke College, Northeastern University, NYU, Occidental College, Oregon State University, Pacific University, Palomar College, Penn State Abington, Pepperdine University, Philadelphia University, Portland State University, Princeton University, Queens College, Quinnipiac University, Rhodes College, RIT(Rochester Institute of Technology), Rowan University, St. Edwards University, St. John’s University, St. Joseph’s University, St. Martins University, Sarah Lawrence College, Seattle Pacific University, Seattle University, Seton Hall University, Siena College, Smith College, Southeastern Louisiana University, Stanford University, Stephen F. Austin University, Stony Brook University, SUNY Albany, SUNY Binghamton, SUNY Cortland, SUNY Delhi, SUNY Oneonta, SUNY Purchase, Syracuse University, Temple University, Texas A&M College Station, Texas A&M Commerce, Texas A&M Corpus Christi, Texas A&M Kingsville, Texas A&M Prairie View(HBCU), Texas A&M San Antonio, Texas A&M Texarkana, Texas Christian University, Texas State University, Texas Wesleyan, Texas Woman’s University, Towson University, Trinity University, Tufts University, United States Naval Academy, University of Bridgeport, University of California Berkeley, University of California Irvine, University of California Los Angeles, University of California Santa Barbara, University of California Santa Cruz, University of Connecticut, University of DC, University of Houston – Victoria, University of Incarnate Word, University of Louisiana Lafayette, University of Maryland, University of Massachusetts, University of Massachusetts – Amherst, University of Missouri St. Louis, University of New Orleans, University of North Texas, University 0f Oregon, UPenn(IVY), University of Portland, University of Puget Sound, University of Rochester, University of Scranton, University of Southern California, University of Texas at Arlington, University of Texas at Austin, University of Texas at Dallas, University of Texas San Antonio, University of Texas at Tyler, University of the South, University of Virginia, University of Washington, Vanderbilt University, Vassar College, Villanova University, Wesleyan University, Westchester Community College, Widener University, Willamette University, Yale University(IVY)…and more! Adelphi University, Alabama State University(HBCU), Alfred State University, Alfred University, American University, Anderson University, Binghamton University, Broome County Community College, Boston College, Boston University, Bowie State University(HBCU), Brooklyn College, Brown University(IVY), Bryant University, Buffalo State, Cal Polytechnic State University – San Luis Obispo, Cal State – Bakersfield, Cal State – Long Beach, Cal State – Los Angeles, Cal State – Northridge, California Institute of Technology, Catholic University, Cazenovia College, Chaminade University of Honolulu, College of William & Mary, Clairmont Consortium (Select Schools), Clark Atlanta University(HBCU), Columbia University(IVY), Coppin State University(HBCU), Cornell University, Delaware State University(HBCU), Drexel University, Duke University, Emory University, Eugene Lang College of Liberal Arts, Fairfield University, Furman University, George Washington University, Georgetown University, Georgia Tech, Gonzaga University, Hamilton College, Hartwick College, Harvard University(IVY), Hawaii Pacific University, Howard University(HBCU), Iona College, Ithaca College, Johns Hopkins University, Kean University, Lafayette University, Lincoln University(HBCU), Linfield College, Loyola University, Manhattanville University, MIT (Massachusetts Institute of Technology), Montclair State University, Morehouse College(HBCU), Morgan State University(HBCU), Morrisville State College, Mount San Antonio College, Muhlenberg College, Northeastern University, NYIT (New York Institute of Technology), NYU (New York University), Pace University, Pacific University, Pepperdine University, Portland State University, Princeton University(IVY), Queens College, Quinnipiac University, Roger Williams University, Rowan State University, Rutgers University, Sacred Heart Univeristy, Seattle Pacific University, St. Joseph’s University, St. Martin’s University, St. Philip’s College(HBCU), St. Thomas Aquinas College, Seattle University, Seton Hall, Siena College, Spelman College(HBCU), Stanford University, Stockton State University, Stony Brook University, SUNY Albany, SUNY Buffalo, SUNY Cobleskill, SUNY Farmingdale, SUNY Fredonia, SUNY New Paltz, SUNY Purchase, SUNY Oneonta, Syracuse University, Temple University, Towson University, Tuskegee University(HBCU),University of California – Berkeley, University of California – Irvine, University of California – Los Angeles (UCLA), University of California – Santa Barbara, University of Delaware, University of the District of Columbia, University of Georgia, University of Hawaii, University of Maryland, University of North Carolina – Chapel Hill, University of Pennsylvania(IVY), University of Portland, University of Puget Sound, University of Rhode Island, University of Richmond, University of Southern California, University of Texas at Austin, University of Texas at San Antonio, University of Virginia, University of Washington, Villanova University, Wake Forest University, Western Oregon University, Whitworth University, Willamette University, Wofford College, Yale University(IVY)…and more! 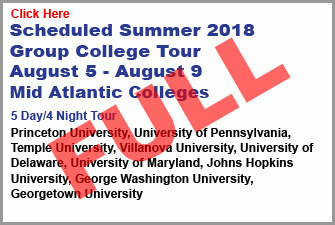 Atlanta Metropolitan State College, Baylor University, Boston College, Boston University, Bowie State University, Brown University, Bryant University, Cal Polytech – San Luis Obispo, Catholic University of America, Cheyney University, Chicago State University, Claremont Consortium, Clark Atlanta University, Clemson University, College of William & Mary, Columbia University, Cooper Union College, Delaware State University, DePaul University, Drexel University, Duke University, Elon University, Emory University, Fashion Institute of Technology, Franklin and Marshall College, George Washington University, Georgetown University, Georgia Tech, Georgia Southern University, Hampton University, Harvard University, Haverford College, High Point University, Howard University, Hudson Valley Community College, Hunter College – CUNY, Iona College, Johns Hopkins University, Kean University, Lafayette College, Lehigh University, Loyola University – Maryland, Manhattanville College, MIT, Montclair State University, Morehouse College, Morgan State University, Morrisville State College, New York University, Northeastern University, Our Lady of the Lake University, Pace University, Pepperdine University, Princeton University, Queens College – CUNY, Quinnipiac University, Rowan University, Sacred Heart University, Sage College of Albany, Santa Clara University, Seton Hall University, Southwestern University, Spelman College, Stanford University, SUNY New Paltz, SUNY – Polytechic Institute, Swarthmore College, Temple University, Texas A&M University, Texas State University, The College of New Jersey, The College of Saint Rose, Trinity University, University at Albany – SUNY, University of California – Berkeley, University of California Los Angeles, University of California – Santa Barbara, University of California – Santa Cruz, University of Connecticut, University of Delaware, University of Georgia, University of Illinois – Chicago, University of Mary Washington, University of Maryland, University of North Carolina-Chapel Hill, University of North Georgia, University of Pennsylvania, University of Richmond, University of San Francisco, University of Southern California, University of Texas at Austin, University of the Incarnate Word, University of Virginia, University of Wisconsin – Madison, Villanova University, Wake Forest University, Wesleyan University, Yale University…and more!